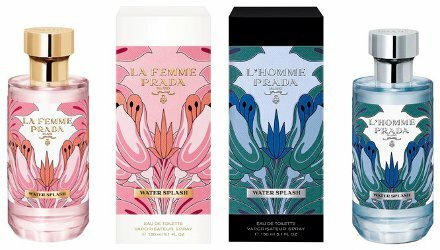 Prada has launched La Femme Prada Water Splash and L'Homme Prada Water Splash, new flankers to to 2016's La Femme Prada and L'Homme Prada. La Femme Prada Water Splash ~ "At once refreshing and indulgent, La Femme Prada Water Splash offers an olfactive escape, transporting its wearer to a tropical paradise. Contained within a tropically printed bottle, La Femme Prada Water Splash presents a zesty Mandarin and fruity Magnolia rest atop deep, sensual Sandalwood." Additional notes include frangipani, muguet and green accord. L’Homme Prada Water Splash ~ "A seductive scent drenched in the spirit of summer, L’Homme Prada Water Splash offers an olfactive escape, transporting its wearer to a tropical paradise Contained within a tropically printed bottle, L’Homme Prada Watersplash, fresh cut Ginger and airy Neroli are layered upon dry Cedarwood and Sandalwood." Additional notes include mandarin. Prada La Femme Prada Water Splash and L'Homme Prada Water Splash are available at John Lewis in the UK, in 150 ml Eau de Toilette. I don’t think that’s always a sign of good sales, but you could be right! Right, but more often, when they’re this quick it means they were planned in advance. And, sometimes, because they are trying to “support” the original. Those bottles are lovely. Will definitely give them a try when I see them.